Everything cost $75 total, including some other TFA, Rogue One, and TLJ stuff. Picked up a Shadows of the Empire - Luke Skywalker in Imperial Guard Disguise at a comic show. It was only $5, and an oddly satisfying purchase. I wasn't collecting when this line came out, but always thought this was a cool design. I doubt Hasbro will ever revisit it, so I scooped it up. I really dig the sculpt - minus the likeness - but that's what the helmets for! Picked up the EU Clone Emperor figure for $7, which I thought was a pretty good deal, considering I've seen a number of the old EU figures for $20+ recently. I've been slowly adding the old EU figures to my collection, because they look drastically different than their modern counterparts, and I prefer the simple articulation aesthetic. 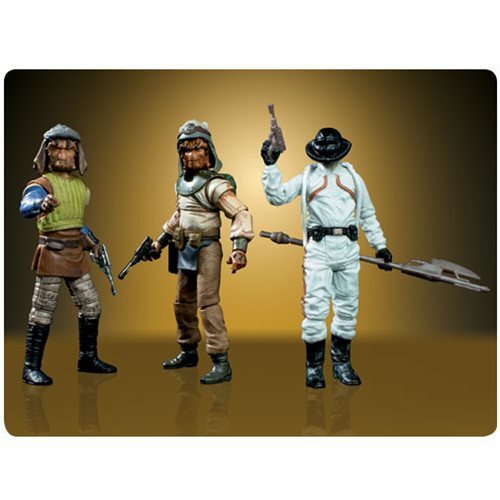 I believe the only two I'm left without now are Kyle Katarn, which I have the modern figure - though the POTF2 version looks like a different character, as well as Dash Rendar, whos design I don't even like, so I'm not sure if I'll ever buy it. I know they also released "EU" ships w/ figures, but those were actually concept designs, so I'm not sure if I'll track any of those down. Am I the only one still filling gaps in my collection with items from previous lines? Picked up the Complete Galaxy Dagobah set for $10. I somehow have the Bogwing creature from the set, loose, but not the rest of it. I must have owned it at some point and got rid of it. Its such a fantastic little diorama, I'm glad I have the full display once again. Its funny how the Yoda likeness is better than most of the modern figures of him! I plan to pick up the POTF2 flashback Yoda eventually too - I didn't collect when it was released, and I think that sculpt is solid as well, taking this figure and adding realistic "hair". In an effort to build a cantina diorama, I ordered a Momaw aka Hammerhead cantina set from Amazon. I never picked these up all those years ago when they were WM exclusives, so I was happy to find one on Amazon under $10. It actually shipped and was sold by Amazon as well, which is puzzling. It was totally beat up and covered in tape & stickers, so I can only imagine the journey it had. While the most recent version of Hammerhead is by far the best, this figure sports a great wash, and I'm happy to add another Ithorian to my collection. darth_sidious wrote: Am I the only one still filling gaps in my collection with items from previous lines? Currently, I have a list of about 20-30 items that I am keeping an eye out for. I’m not actively trying to find them, but since they are all from the Legacy or TVC line, I’m sure they’ll be the definite version of the character. Plus, I’m trying to pick up the X-Wings I missed as well. Eventually I’d like to get two or three of the ANH Y-Wings as well for a diorama...But I don’t have enough space for that diorama right now, and I’m also curious to see if they will do a larger scaled Y-Wing as well. As for picking up previous made things, I've almost always been caught up. I usually buy whatever comes out, then when a newer or better version comes out, I either sell it, or use it for custom parts. The only thing right now that I want but don't have it the TVC island Rey. I just haven't felt any urgency to order it. I could use some more TVC mimban Stormtroopers too. One issue I have encountered is that not only do I not have certain figures for my collection, but I also need those same figures for custom fodder. I have about 10 figures I know I need for projects, but I don’t have ones to keep original either. Jodo wrote: One issue I have encountered is that not only do I not have certain figures for my collection, but I also need those same figures for custom fodder. I have about 10 figures I know I need for projects, but I don’t have ones to keep original either. Do you have a want/need list just in case anybody comes across what you're looking for and can help you out? There is a local store in my area that has 3 locations that sell Star Wars figures from all lines as well as other action figure lines, CDs, movies and comic books. I've forced myself to become much more creative when customizing now, because I don't chop up older figures anymore. I stick to whats in my fodder bin, or I repurpose older customs into something new. I've actually re-bought figures (to place back into my collection) that I destroyed in order to make customs many years ago, so I had to put an end to that practice. In the last few years, I've grown to appreciate a great many of the older releases, which is bringing a new level of enjoyment to the hobby for me. I will have to update my wants list soon, as that’s a very good idea!!! darth_sidious wrote: I've forced myself to become much more creative when customizing now, because I don't chop up older figures anymore. I stick to whats in my fodder bin, or I repurpose older customs into something new. I've actually re-bought figures (to place back into my collection) that I destroyed in order to make customs many years ago, so I had to put an end to that practice. In the last few years, I've grown to appreciate a great many of the older releases, which is bringing a new level of enjoyment to the hobby for me. Honestly, you’re onto something here. As I see it, older more easily customizable figures will be harder and harder to find, and therefore the parts are more valuable too. With the new TBS/TVC jointed torsos and stupid legs, we can’t even buy new figures for good fodder anymore. Agreed on the parts being harder to use for customs... that's why when a set like this is announced, using the traditional hip style and soft plastic parts, I get excited.